That’s right, we’re going to need a new name for this blog. 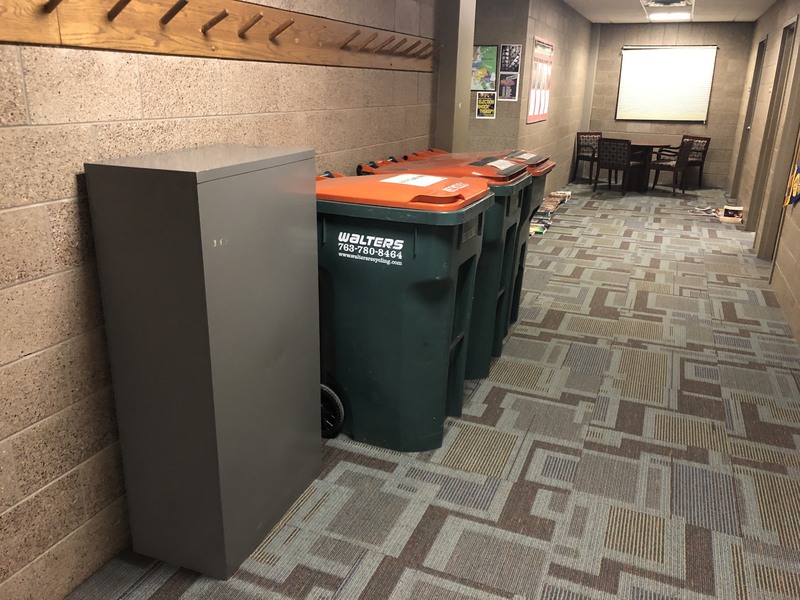 As of this summer, the History Department will leave its longtime home on AC 2nd and relocate to CC 4th, where we’ll join our Political Science friends in the office suite currently housing the Education Department. We won’t move out until after spring commencement, but we’re well along in the process of starting to clean out our AC2 offices. 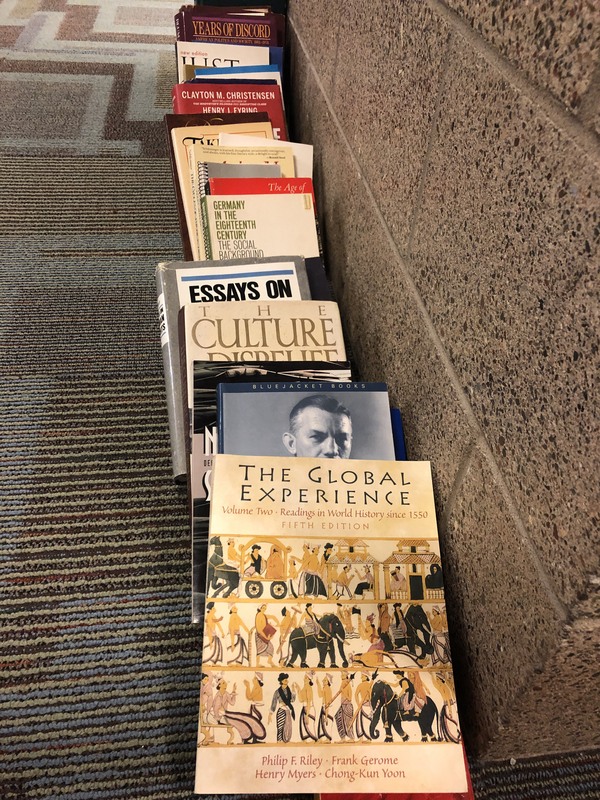 Which means that there’s a growing collection of books accumulating on AC 2nd — free for any student, alum, or other history buff who wants to add to their library. Author Chris GehrzPosted on April 17, 2019 Categories News & AnnouncementsLeave a comment on We’re Moving! One of the newest courses in Bethel’s general education curriculum is GES160 Inquiry Seminar (or “IQ”). Replacing the older College Writing and Introduction to Liberal Arts courses, IQ sections introduce first-year students to the liberal arts in the Christian tradition and help prepare them for research, speaking, and writing assignments in later courses. Two of our professors have already taught Inquiry Seminar. Chris Gehrz offered one of the first sections when the course launched in Fall 2017. Asking what it meant to seek Christian unity in the midst of an increasingly divided society, students read books like Christena Cleveland’s Disunity in Christ and John Inazu’s Confident Pluralism, presented case studies of schisms in church history, and researched causes of polarization in 21st century America. When Dr. Kooistra reprises the section this fall, students will read Martha Hode’s The Sea Captain’s Wife, a history of a nineteenth century working-class, interracial marriage and family constructed from a cache of family letters. In addition, our newest adjunct professor, Annie Berglund, will debut an IQ section called “All God’s Creatures: Animals as Property or Peers?” And our Political Science colleague Chris Moore will reprise a popular section on the politics of food. I’m very happy to share the draft program for the 6th annual Minnesota Undergraduate History Symposium, which is now less than a month away: Saturday, April 27th. • We expect 45 students to present historical research at this year’s symposium! That eclipses the previous record of 37, set the first time we hosted in 2016. • We’ll be welcoming guests from eleven colleges and universities, including previous MUHS hosts University of Northwestern-St. Paul (2014, 2017), Bethany Lutheran College (2015), and Saint Mary’s University of Minnesota (2018). We’ll also welcome back several schools whose students or faculty were on campus three years ago: Augsburg University, Concordia College-Moorhead, Martin Luther College, St. Olaf College, and the University of St. Thomas. • Three departments will be making their first appearances at MUHS: our St. Paul neighbors at St. Catherine University, plus Wartburg College (Waverly, Iowa) and Dordt College (Sioux Center, IA) — the first symposium participants to come from beyond Minnesota. • One more first… This year’s symposium will begin with a keynote speaker: Kent Whitworth, the executive director and CEO of the Minnesota Historical Society. A recent guest in our Intro to History class, Kent will share remarks and answer questions about the future of public history and the History Relevance campaign. If any other Bethel students, faculty, or alumni are interested in attending the symposium, there’s no registration fee. Just get in touch with me to help us get a final head count. Today we conclude our roundtable discussion with History alumni-turned-attorneys Wade Adamson ’09, Gina Schulz ’07, and Aaron Thom ’08. In part one they recalled how they decided to study law. Today: applying to law school, and how Aaron, Gina, and Wade got where they are in their careers. What advice would you give students who are considering applying to law school? What should they be considering as they discern if that’s the right path for them? Wade Adamson (J.D., William Mitchell, 2013): First of all, you should know that it is a huge financial decision to make. Not only do you have any student debt from undergrad that you might be carrying, but you will likely also incur more (sometimes significantly more) debt to finance your time in law school. That, coupled with the fact that you are foregoing three years of income during your time in law school, means that you will likely graduate from law school in a significantly worse financial position than you otherwise would be if you did not go to law school, and significantly behind your peers in that regard. Gina Schulz (J.D., University of Michigan, 2014): I had plenty of classmates who went straight from undergrad to law school, but personally I don’t think that’s a good idea. Even with scholarships, law school is a huge investment and most students take on a lot of debt. I think it’s worth spending some time figuring out whether it’s something you actually want to do before you have $200k in loans to pay back. WA: Understand that a law degree is no guarantee of a job, nor is it a guarantee of a financially lucrative job, as many people assume. You might find yourself called to a career path in public service or simply unable to compete for the more highly-compensated legal jobs based on your resume and/or work experience. In that case, the repayment of large amounts of student loan debt can significantly impact your life in the years to come. Aaron Thom (J.D., University of Minnesota, 2011): Decide whether you like dealing with conflict and competition. Particularly in litigation, conflict is constant and inevitable—on all fronts. There’s conflict between lawyers vying for the same client, conflict between associates competing for a partner’s approval, attorney-client conflict regarding strategy and resolution of difficult issues, conflict between attorneys on opposing sides of a dispute. The stress of an attorney’s job is well recognized. What isn’t so clear—at least it wasn’t to me—was how much, and how many different manifestations of, tension exists. WA: You should make sure you know what being a lawyer actually means. Find attorneys to connect with and talk to them about their jobs to get a better sense of what the day-to-day life of an attorney is like. Given the huge investment in time and money necessary to complete law school, you should be as certain as you can be that it is the right career path for you. If your idea of the life of an attorney is based on TV and movies, that is a sign that you have not done much research or investigation into what your future will be. GS: To the extent that you can, talk to lawyers in different fields to figure out what their lives look like. Lawyers get requests to have coffee and talk about their careers all the time, and most of them are happy to do it. I didn’t have any connections to lawyers when I was applying, so I had no idea what I was getting myself into. If that’s your situation, feel free to reach out to me and I can find you some people to talk to. If they do decide to go to law school, what can they do to strengthen their application? WA: Law school applications are similar to undergrad applications in that the schools say there is a “full-picture” approach to admissions and that every application is evaluated in its entirety, including work experience, personal essays, etc. However, you should know that absent some sort of extraordinary feature to your application, it will likely come down to two numbers: undergraduate GPA and LSAT score. WA: The best thing you can do right now for your law school application is perform well in undergrad and earn the highest GPA you can. Bethel is a great school, but you are not attending Harvard or Stanford or some other Ivy League school where a less-than-stellar GPA may be overlooked. You should be ensuring your GPA is an accurate reflection of your intelligence and ability as a student. Once you are ready to start thinking about applying for law school, you should obtain LSAT prep books to prepare for the LSAT and attempt to earn the highest score possible. This will likely involve many, many hours of preparation to familiarize yourself with the LSAT and perform practice exams. AT: I think if a student wants to set him/herself apart from the pack, he/she’ll choose an area in which to specialize (like science, to use the example I mentioned yesterday) during college rather than waiting until law school to start shaping his/her future career. Law is such a diverse field. The study and practice of law itself does not determine a lawyer’s focus or direction. The lawyer needs to choose what she or he wants to do — and it’s best to start making these decisions as early as possible to avoid merely drifting into a legal field that is not of interest to the student. Lawyers who lack passion are soon to be not lawyers anymore. Tell us a bit about your path from law school to your current job. AT: I went from law school to the firm Robins Kaplan. It was exhausting and trying, but I loved it. I received amazing experience from day 1 — literally. I then did a short stint at Madel before starting my own firm with my colleague, and favorite lawyer in the world, Sam Ellingson. WA: My decision to go to law school was impacted by the economic situation in the United States at the time. I graduated in December 2008, which was in the heart of the Great Recession. Jobs were hard to come by at a time when the country was losing hundreds of thousands of jobs per month. My plan was to attend law school with the idea that by the time I graduated three years later the economy would have rebounded. Unfortunately, I was not the only person with that plan in mind. The year I entered law school, 2010, was the highest year of enrollment in the history of the United States. That meant a lot of competition amongst students, as law school courses are graded on a curve and there were more students to compete against. GS: It took me awhile to figure out where I belonged in the legal profession, in part because I went to law school without any idea of what that meant. WA: During law school I thought I wanted to be a litigator and pursued opportunities to be in the courthouse as much as possible. I was a judicial intern for a federal district judge in Minneapolis the summer after my 1L year, an intern at a county attorney’s office the summer after my 2L year, and an intern for a federal magistrate judge while also studying for the bar exam the summer after I graduated. Once I passed the bar exam I took a job as a judicial law clerk for a judge in Anoka County. I felt incredibly fortunate to have that job given the huge numbers of law students entering the job market at that time coupled with the fact that legal hiring was still far below the pre-recession levels. At the same time, I knew I did not want to be a litigator. After a few months of work, I began to think about what my next job would be. I had given the judge I worked for a commitment that I would stay for at least one year, so I still had about 8 months to go on that commitment, but I knew I had to start working hard to set myself up for a good opportunity come that time. GS: Soon after graduating, though, I clerked for a judge on the Minnesota Court of Appeals, where I saw the appellate public defenders practice. Even though I had no background in criminal law, I finally saw a job that looked right for me: representing indigent clients in criminal appeals. After a couple of years in other (great but not quite perfect) positions, I got the job. WA: I spent nearly a year networking and meeting as many transactional attorneys as I could before and after work for breakfasts, coffees, and/or happy hours. Through those efforts I met two attorneys at Gray Plant Mooty, and eventually they had an opening for an associate attorney that I interviewed for and was hired. I worked there from August 2015 through this past February, when I started a new position as an associate attorney for the new Minneapolis office of a large, national firm called Saul Ewing Arnstein & Lehr. What’s most enjoyable and most challenging about your work? WA: My practice has been focused on transactional commercial real estate work since I began in private practice in 2015. I really enjoy helping my clients accomplish their business goals and playing a key role in the success of their companies. I enjoy being a transactional attorney because my role is to help make deals happen, which are beneficial to my clients. The completion of any project is usually a time of celebration for the client, which I also enjoy being a part of. GS: It’s truly my dream job, and I feel lucky every day that I get paid for doing what I love. The caseload can be stressful, the stakes are generally pretty high, and I make way less money than I would at a firm. But, in the end, I read and write and think for a living, and I get to do that on behalf of clients I like and a cause that I believe in. It’s pretty great. WA: The most challenging part of my job is how stressful and demanding it is. There can be tight deadlines, long days/nights at the office, working on the weekends, etc. The job of an associate attorney at a large law firm is certainly not a 9-5 job, and in an era of constant connectivity, I can’t really ever “disconnect” from the office, which can be taxing. AT: I enjoy the work I’m currently doing more than anything I’ve ever done before. We choose what cases to take, and how we litigate them. Our practice is what we make it. Of course, that can be stressful. But it’s more exhilarating than anything. In addition to spotlighting individual alumni who have taken various career paths, occasionally we like to host a kind of roundtable discussion with alumni from a single field. In the past we’ve talked to former students who have gone into graduate school in history and into middle/high school teaching. This week we’re excited to hear from three alumni who practice law: Gina Schulz ’07, a Minnesota public defender in the Appellate Office; Aaron Thom ’08, partner with Thom & Ellingson; and Wade Adamson ’09, associate with Saul Ewing Arnstein & Lehr. Tomorrow we’ll learn how they found their way to their current positions, but we’ll start with their time at Bethel. What’s your favorite memory as a History major at Bethel? Wade Adamson: Probably my Senior Seminar course. While it was a huge time commitment and stressful, it was also very enjoyable to be able to complete such a large project and came with a sense of accomplishment when I had completed it. Gina Schulz: I spent a semester at Oxford and — as corny as this sounds — it was really life-changing. The classes were one-on-one, and I had to write a research paper every week and read it out loud to the professor who challenged every claim. It was terrifying but/and made me into a much better thinker and writer. WA: I also really enjoyed working as a TA for the late G.W. Carlson for most of time at Bethel. GS: I generally have very pleasant memories of my time in the history department! I loved the classes and the professors, and I feel really grateful for the small class sizes and individual attention, especially toward the end when I needed a lot of guidance in preparing for life after graduation. At what point did you decide to go to law school? Did you think of yourself as a pre-law student while you were at Bethel? AT: I decided to go to law school before I started college — when I was a high-school mock-trialer. I didn’t consider myself a pre-law student while at Bethel. I just took each class for what it was. But some of my classes—such as American Constitutional History—were law-focused. WA: I never considered myself “pre-law” at Bethel. All throughout undergrad, I had assumed I would end up in education, either as a K-12 teacher, like both my parents, or, once I realized that was not for me, as a history professor at a college or university somewhere. It wasn’t until I had decided against those options, and was working a job I did not particularly like, that I decided to go to law school. GS: Did I think of myself as pre-law at Bethel? Not at all! I didn’t even consider law school until I was three years out and had no idea what to do with my life. I registered for the LSAT on a whim, and the rest just kind of happened. I do not recommend this approach. 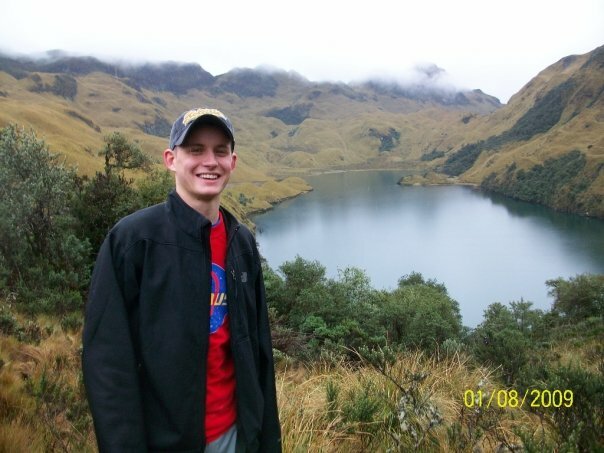 WA: I decided to go to law school after I had graduated from Bethel and was working for a company down in Eagan, where I worked for a year and a half after graduating a semester early from Bethel. I had always kept the idea of law school in the back of my mind, but it was not my first choice of career when I entered undergrad at Bethel. AT: Because law has such a rich history, I think it would make sense for Bethel to offer something like a “pre-law” package—even if this is just a recommended group of classes as opposed to something formal that results in a degree or title. [At Bethel Pre-Law isn’t a major, but faculty advising plus recommended courses.] 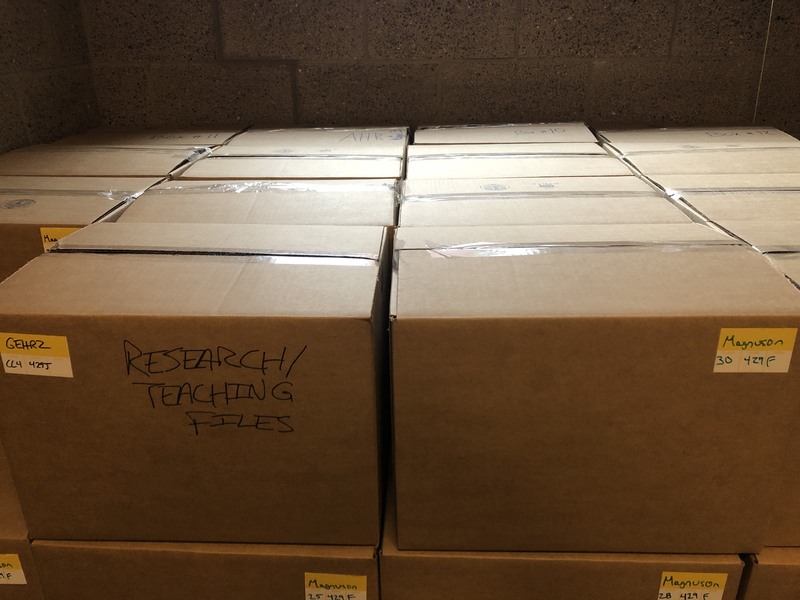 This package could also include philosophy classes because philosophy and law also have an interesting relationship — scholars like William Blackstone, Carl Llewellyn, H.L.A. Hart, Ronald Dworkin, and others could be studied. It could also include an economics class emphasizing law and economics (e.g., Friedman, Coase, and Richard Posner) and anti-trust theories. AT: I also think it’s important, however, for law students to have an area of focus beyond just “pre-law.” This will help shape the lawyer’s future. For example, if a student has a good mind for science and wants to be a lawyer, she or he should study chemistry, biology, etc., and potentially be a patent attorney. Traditionally, History has been a popular college major for future law students. Did you feel like your History major at Bethel prepared you well for law school? GS: I do think my History major prepared me well for law school. Law isn’t static and it doesn’t develop in a vacuum, so understanding historical context is extremely valuable. The practical research and analytical tools you gain studying history are also very transferable. WA: I was a History major with minors in Political Science and Spanish. I think in many ways my undergraduate education did prepare me well for law school. A History major develops, or at least should develop, an ability to read and synthesize large amounts of information from reading long and occasionally dense material, which is what you will be doing a lot of in law school. It is also a major that involves discussion and consideration of political ideologies and debates throughout history, which informs a person’s understanding of the role of government and the law in the daily lives of a nation’s citizens. These concepts are foundational to the study of the law. AT: The critical thinking skills, ability to think logically and linearly, and practice in advancing arguments have all been helpful to me. But I have difficulty disaggregating my history, English lit, and philosophy combined educational experience, so I can’t say much more about how history helped me in particular. Is there anything you wish you would have done differently to prepare for law school? GS: In hindsight, I wish I would have taken at least one class on American constitutional history and at least one Political Science course. I went to law school with only the foggiest idea of what the Constitution was and how the government works (sad, but true), and those are pretty foundational concepts. Also, I wish I would have taken Spanish! WA: Law school is also a unique educational environment that involves studying, reading, and writing in an entirely novel way. In that respect, there is no real preparation for law school. No other field of study or undergraduate major will teach someone legal writing, or how to brief a case, or how to perform issue-spotting for law school exams. In that respect, I do not think I would have done anything differently in my undergraduate studies to prepare myself for law school. Tomorrow: applying to law school and finding a job. Join Us for Alumni Trivia Night! Join us Thursday, April 4th for Alumni Trivia Night 2019! Yes, it’s a night of pub trivia with the departments of History, Political Science and Philosophy. Co-sponsored by Bethel’s Office of Alumni Relations, there will be prizes, free food, and a chance to spend an hour or so testing your trivia knowledge with faculty, alumni, and current students. We’ll start around 5pm at The Exchange Food & Drink in New Brighton, just off the County Road E2 exit from I-35W. Please register in advance to help us plan numbers. You can also find details and invite fellow alumni via our Facebook page. If you have questions, get in touch with Poli Sci chair Chris Moore. Otherwise, we’ll look forward to seeing you on April 4th! Author Chris GehrzPosted on March 12, 2019 Categories Events, News & AnnouncementsLeave a comment on Join Us for Alumni Trivia Night! • For American history and politics buffs… This Thursday morning (3/7, 11:15am) Political Science professor Mitchell Krumm will examine how Federalists and Anti-Federalists used the ideas of the French philosopher Montesquieu to articulate “dramatically different conceptions of liberty.” Dr. Krumm is teaching our cross-listed American Constitutional History course this spring. • Then on the other side of Spring Break, our own Profs. 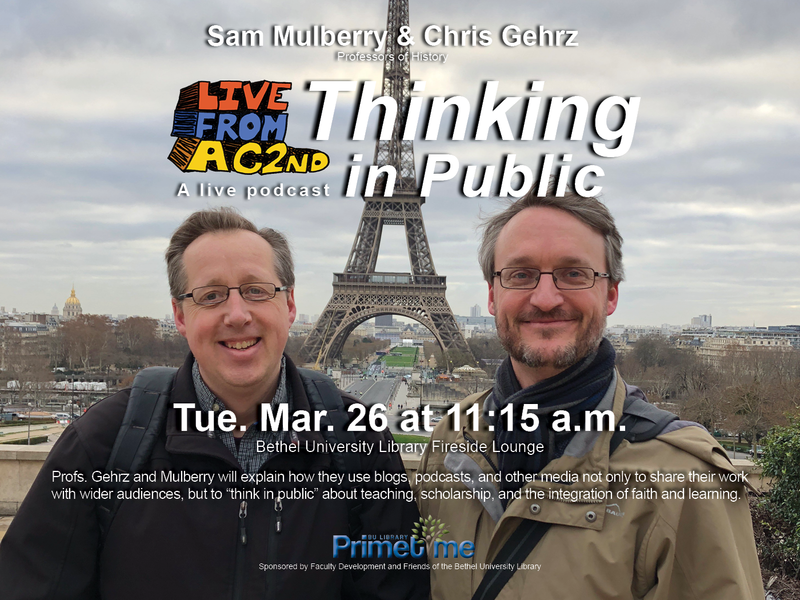 Sam Mulberry and Chris Gehrz will talk about the importance of professors using blogs, podcasts, and other media to “‘think in public’ about teaching, scholarship, and the integration of faith and learning” (Tu 3/26, 11:15am). Some people emerge from the womb and know they want to be doctors. Or writers. Or computer engineers. Or vigilantes who clean up the streets without permission of the law. Who knows. However, if you aren’t one of those people, feel free to envy their easy choices, but don’t be too hard on yourself. You have time to choose your major, even after you move into your new and shiny school and survive welcome week…. You will not be bound forever by your choices regarding your major. Or school. Or your friends even. You may even surprise yourself as you discover what you’re good at or most invested in. And that’s exciting. In fact, Bethel has officially replaced “Undecided” as an alternative to particular majors with the “Exploratory” category, which better captures the spirit of the first year of college. Developmentally, it’s a time that’s meant to encourage self-discovery as you encounter diverse people, perspectives, and opportunities and learn to listen for God’s call on your life. Katie, who ended up choosing an English major, adds that entering Bethel as an Exploratory major is especially well suited to our liberal arts curriculum. Rather than viewing every course choice as a zero-sum set of options leading to narrow professional pathways, you’re liberated to enjoy studying everything from the natural sciences and fine arts to Western civ courses like Christianity and Western Culture and Western Humanity in Christian Perspective and gen ed surveys like American Civilization and History of Islam. Read Katie’s full post here. And watch this short video, featuring students who came to Bethel not knowing their major. Bethel cancelled classes this afternoon, which deprived my Roman Civ students of my lecture on the Carthaginian general Hannibal’s daring journey over the Alps in 218 BCE. But the snow day gave me the opportunity to watch Frozen with my daughters, and think other snowy thoughts. Did you know the Alps also have snow? Things got a little out of control and I ended up making a 3D annotated map of Hannibal’s voyage. I’ll share my work with my Roman Civ students on Friday. I’ll also break down the process and assign my Digital Humanities students the task of making their own map later this semester. For now, take a look at the final version on Sketchfab.